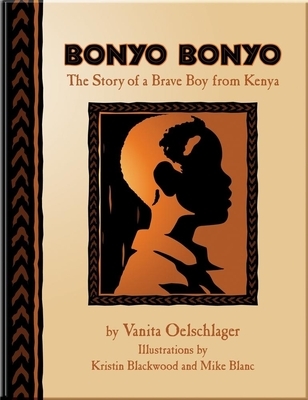 Bonyo Bonyo is a true story about how a Kenyan boy's courage and determination, along with critical support from family and strangers, helped him live out his dream of becoming a physician. Pursuing his goal forces him to leave his family and ultimately his country. But years later he is able to return as a doctor with the resources to build a much-needed clinic. Bonyo's story is full of wonderful core values: individual determination, growth through loss and pain, willingness of others to help us reach goals, the benefits of giving back. Intended for 4-8 year olds, ones who are old enough to understand how hard it would be to leave your family just so you can continue to go to school. Vanita Oelschlager wrote this book after interviewing Dr. Bonyo Bonyo. Dr. Bonyo Bonyo practices family medicine in Akron, Ohio. He tells each patient that they are family to him. Vanita Oelschlager is a wife, mother, grandmother, philanthropist, former teacher, current caregiver, author and poet. She is a graduate of Mt. Union College in Alliance, Ohio, where she currently serves as a Trustee. Vanita is also Writer in Residence for the Literacy Program at The University of Akron.Kristin Blackwood is an experienced illustrator. Some of her other books include My Grampy Can't Walk; Let Me Bee; Big Blue; Made In China; What Pet Will I Get? ; Ivy in Bloom and Ivan's Great Fall. She uses a linoleum reduction technique for creating the illustrations for this story. Kristin lives in Lakewood, Ohio, with her two daughters. Mike Blanc is a career artist, who has illustrated countless publications for both corporate and public interests, worldwide. After 35 accomplished years of traditional drawing and painting, he now prefers the digital mediums. Previous titles by Mike and Vanita include Postcards from a War and Francesca. Mike lives in Ohio.